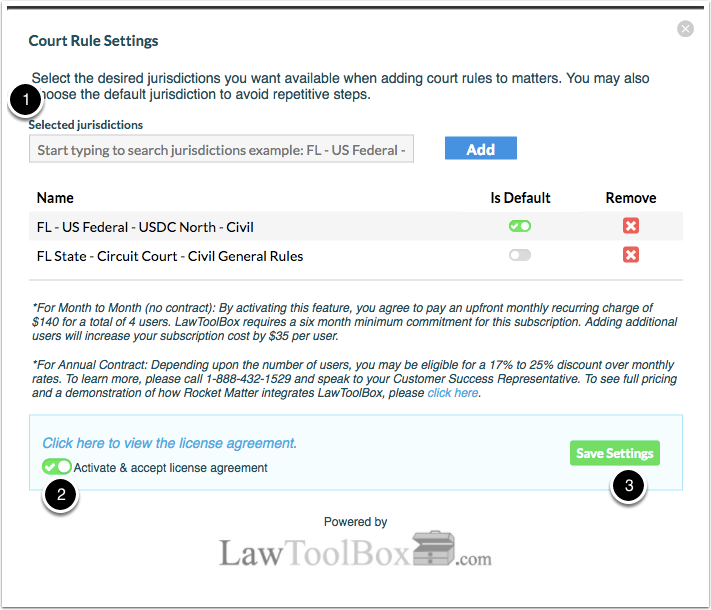 Rocket Matter Knowledge Base LawToolBox - Court Rule CalendaringHow to get started with the LawToolBox integration. 1. Click 'Settings' on left hand navigation panel and click on 'Court Rules'. 2. Select your jurisdictions and activate and accept the lisence agreement. Click 'Save Settings'. Prev: How to bill for an activity, task or expense code using LEDES billing. Next: How to integrate my existing LawToolBox account with Rocket Matter.